Sometimes it's impossible to concentrate — let alone direct your personal assistant Siri — when someone is blasting music on their phone or talking to thin air. I mean I'm loud, but not that loud. So, it's a relief to hear that this could be changing for the better. According to an patent application by Apple, we may be able to direct Siri via iMessage on an iPhone. This would be a godsend for getting things done in a less-than-practical environment, like the subway. Pretty good, right? Let's not get ahead of ourselves. In order to even use Siri or iMessage successfully, you need either a good Wi-Fi or cellular connection, or they just won't work. On subway cars outside of Manhattan, neither is always reliable, so that's definitely something to take into consideration here. In one example process, a graphical user interface (GUI) having a plurality of previous messages between a user of the electronic device and the digital assistant can be displayed on a display. The plurality of previous messages can be presented in a conversational view. User input can be received and in response to receiving the user input, the user input can be displayed as a first message in the GUI. A contextual state of the electronic device corresponding to the displayed user input can be stored. The process can cause an action to be performed in accordance with a user intent derived from the user input. A response based on the action can be displayed as a second message in the GUI. The messaging platform can enable multiple modes of input (e.g., text, audio, images, video, etc.) to be sent and received. A user request can thus define a request to the digital assistant using a combination of inputs (e.g., image and text)... the messaging platform is a visual interface which permits interactions in a broader range of environments than voice/audio based platforms. A digital assistant in a message environment can thus enable greater accessibility to the digital assistant. 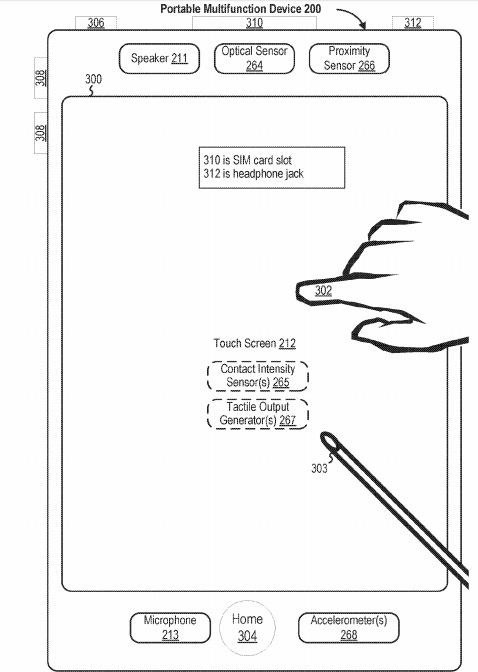 Apple's patent app also suggests that Siri could take part in multi-user conversations. The chronological order of the messages sent would also enable the user(s) to scroll back and review the contextual history of tasks assigned to the personal assistant. It's basically a way of showing Siri interactions as typed queries and written responses. 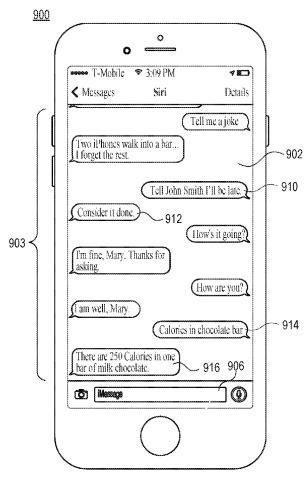 This patent isn't the first use of Siri in iMessage that we've encountered. 9to5Mac points out that there was a previous patent application published in November which detailed how Siri would interject in group chats. For example, the smart assistant would be able to schedule meetings based on everyone's location/availability in group chats. This isn't exactly great news for those of us who are always late. (Like me, through no fault of my own — I'm subject to the whims of the L-line.) I don't know if I would want my friends knowing my exact location if I'm being honest ... My thoughts on this may be redundant anyway considering the vague reports from Israel that this feature will be rolled out in iOS 11 anyway. It's interesting to note Siri's newfound similarity to Google Allo. A messenger app with an inbuilt Google Assistant so you don't have to speak to it. Now, we're not saying it's a ripoff per se, it's just that Allo was shown off at I/O a year ago, so it had to have been known to insiders by May 10, 2016, when the patent was filed. Apple's Siri patent application was filed 8 days before Allo was announced which is a very telling coincidence, don't you think? Meanwhile, Apple has been working away to better the smart assistant in several other ways, namely voice recognition ability. At the moment, Siri can be activated by anyone's voice, so people using their iOS devices nearby could trigger it, which is an all-around irritating situation for everyone. Apple is apparently getting rid of the "Hey Siri" trigger phrase and using user voice activation instead, according to another patent application. I guess we'll have to wait and see how that turns out, but iMessage and voice recognition would certainly come in handy in many situations.